Expanding the Super Rugby competition to include countries such as Argentina and Japan will be discussed at a series of meetings next month. New Zealand Rugby Union chief executive Steve Tew has confirmed the prospect of expansion beyond Australia, New Zealand and South Africa. New methods of broadcasting will also be on the table when SANZAR officials negotiate their model beyond 2016. South Africa's desire to field six teams after the 15-team structure winds up in 2015 has prompted officials to consider a different format. One possibility is for teams to play matches only within their own conference through the regular season, followed by a wider, inter-conference finals series. Teams from Argentina or Japan could be added into larger New Zealand and Australian conferences. Tew doesn't want to discuss details but says the NZRU have certain "non-negotiables", including a desire that the tournament be no longer than the current model, which stretches beyond six months, and preferably shorter. He says Argentina's involvement will hinge to some degree on that country having more control over its leading players, most of whom are contracted by northern hemisphere clubs. 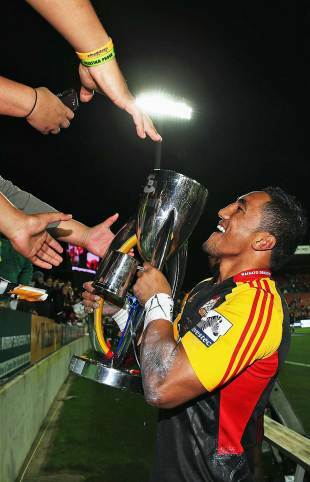 "We're committed to them being involved in Super Rugby at some point in time. One of the options is for some expansion at this next juncture for them," he said. "If we are going to expand then there's probably room for expansion in more territories than just Argentina." Tew says a suggestion that Australia and New Zealand form a competition that doesn't involve South African teams is unrealistic commercially because of the sizeable broadcast revenue out of South Africa. Super Rugby games in South Africa are also acknowledged by NZRU high performance staff as a proving ground for future Test players, he says. Tew hopes agreement can be reached by the end of this year and be taken to the broadcast market in 2014. "We think we've had a good competition over the last 17 years. We're keen to preserve it in a form that will be future-proof," he said. "All three countries have pay television platforms that rely on a lot of content. This competition provides a lot of content." Tew indicated that New Zealand's broadcast rights may not be sold en masse to pay network Sky as has been the case since the sport turned professional in 1996. He is encouraged that other platforms, such as digital live streaming, have entered the New Zealand market and he won't rule out rugby spreading its reach. "Sky will remain an important partner until the end of this deal and it will be a brave person who predicts they won't be an important part of the next one," he said. "But we're encouraged by what modern technology is giving us, including the opportunity to view things on more than one screen."